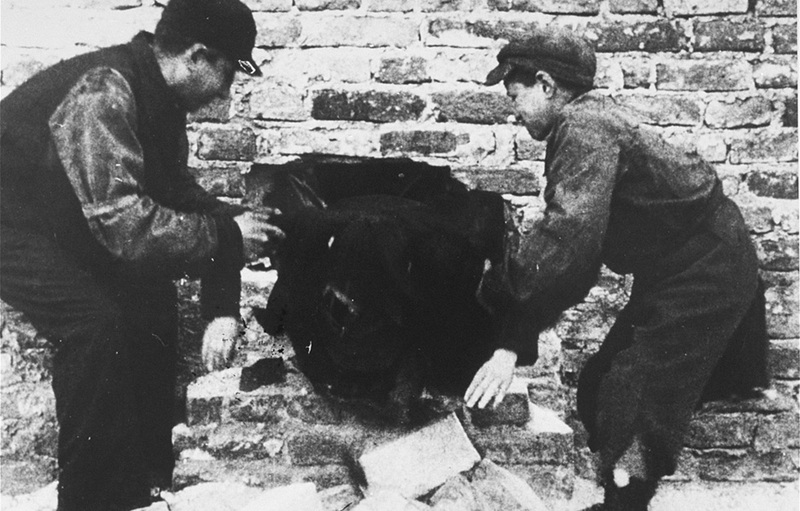 The Warsaw Ghetto was sealed in mid-November, 1940. Deportations ramped up from July on, in 1942, and over the summer, 265,000 Jews were deported from Warsaw to Treblinka, an extermination camp. More than 10,000 were also sent to labor camps. Just about 60,000 Jews remained in the ghetto. Jews were told they were being resettled to work, but many in the ghetto knew or suspected more ominous fates. Through the fall, groups met and organized for self-defense and to plan for resisting future deportations. The Jewish Combat Organization (ZOB) and other factions smuggled some weapons into the ghetto with support from the Polish Underground. When a deportation began on January 18, 1943, Jewish Fighters attacked, surprising the Nazis. This pre-figured the later revolt and proved to the Fighters and other Jews that armed resistance was possible. The SS withdrew within a few days. A mass deportation had been stymied for the first time. Stunned, the Nazis began preparations for the complete destruction of the ghetto. 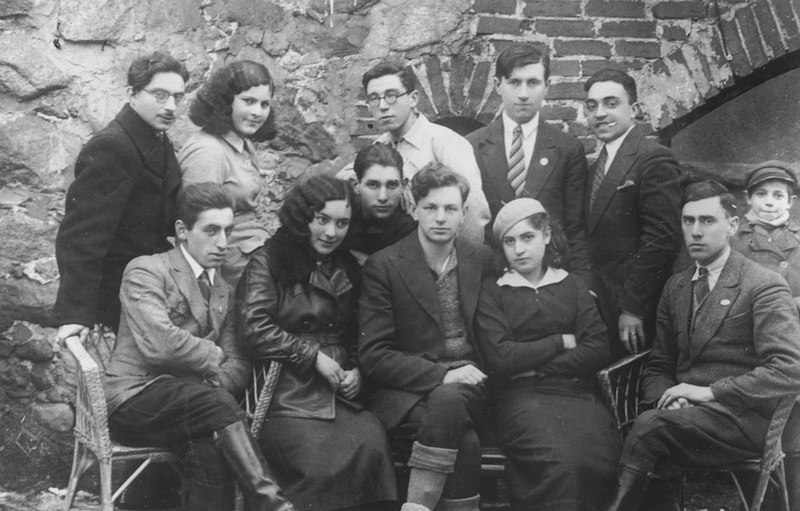 Yitzhak Zuckerman (front row, center) with members of a Zionist youth movement. Youth groups were a key part of revolts, including Warsaw to Beit Lohamei Haghetaot. Source: courtesy of USHMM Photo Archives. Children were sometimes able to smuggle food into the ghetto. Source: Yad Vashem, courtesy of USHMM Photo Archives. When the SS re-entered the ghetto, they found few Jews to round up. Jewish fighters attacked the soldiers with their very few rifles, pistols, and crude explosives. Resistance and combat operations continued for nearly a month, with heavy casualties among the Jewish fighters and relatively few among the Nazis--but no surrender was to occur. 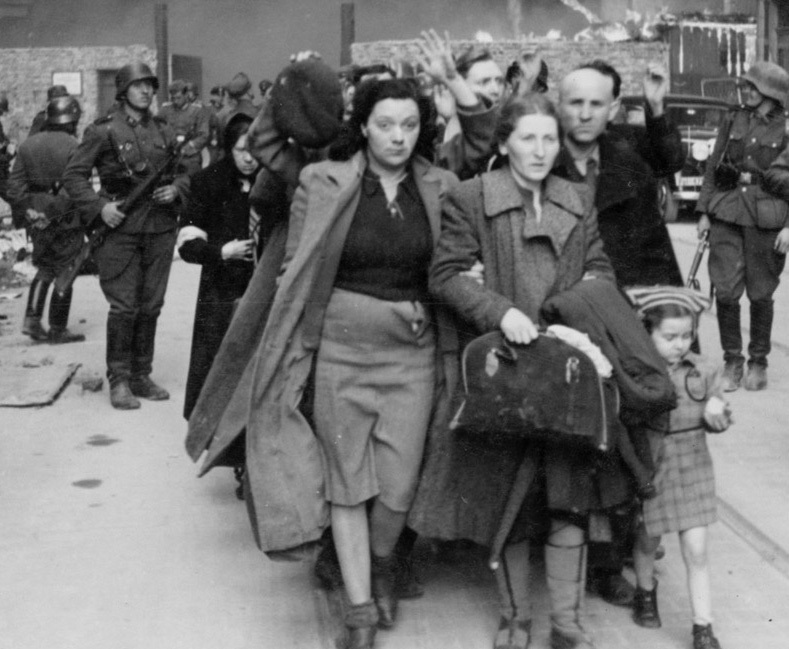 Suppression of Warsaw Ghetto Uprising— German soldiers lead the Neyer family away for deportation. US National Archives. Over the final few days of the revolt, in mid-May, the SS set fire to the ghetto, burning it to the ground. Those Jews in hiding and still surviving were rounded up and deported to concentration and labor camps. The Jewish fighters who did not flee through the sewer system were killed. May 16, 1943, marked the end of the Warsaw Ghetto Uprising. The main synagogue was blown up, and Warsaw’s Jewish quarter was burned and razed. The Uprising of young Jewish civilians, ill-equipped for combat and without adequate weaponry, lasted longer than some countries had held out before surrendering to the Nazis. Over 7,000 Jews were killed. Official German records list 16 Nazi soldiers as casualties, but subsequent research suggests the number was over 300. The Warsaw Ghetto Uprising was not the first or last episode of physical resistance to the Nazis in Jewish ghettos or camps, but it was the largest and most sustained of those efforts. Subsequent rebellions in other ghettos and even in extermination camps drew on the inspiration of the Jewish Fighters of the Warsaw Ghetto. 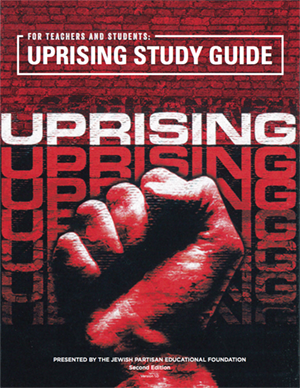 The Study Guide for the film, Uprising, details historical context, enlarges on the description of the Uprising, and poses important questions about human behavior. Students confront the idea that histories such as the Holocaust are not inevitable but are possible because individuals, groups, and nations make decisions to act or not to act. Uprising may be rented or bought at Amazon, iTunes, and other online stores.